Does anyone else here on the forums play Minecraft? I used to play it almost 24/7 form when I woke up to the early hours of the morning it was that addictive. For those of you who haven't heard of the game, there is no main aim or storyline behind the game, you simply just build and create whatever you want. At the moment it's only available on PC and Mac, but they're thinking about porting it to the XBOX and other consoles (where there's already multiple bad and mediocre recreations of the game). There will be a video below showing roughly what Minecraft is, and don't judge a book by it's cover! I like to think of it as a grown up version of lego :). Last edited by Quicksilver7714; 08-15-2011 at 06:22 AM. One of the best Sandbox games EVER. Although GTA: San Andreas is still way better :D.
December 1st will see the launch of Infinity Blade 2, the much anticipated follow-up that brings much improved visuals to one of iOS’ strongest titles. First showcased at this year’s iPhone 4S keynote, Infinity Blade 2 has already gotten plenty of hands-on time by the likes of IGN and SlideToPlay, and is expected to be a massive hit when it lands next week. Infinity Blade 2 will feature more weapons, an updated combat system, and more areas to explore while remaining familiar to the gameplay you love. The visuals, however, are what Infinity Blade is renown for. In the latest trailer, the developers discuss the game’s jaw-dropping graphics that’ll be delivered thanks to Apple’s A5 processor. Catch the video after the break! Frozenbite has announced that Trine 2, the sequel to their original best-selling game, will be coming soon, and will be getting cross-platform multiplayer capabilities. The new multiplayer features will work through Valve’s Steam Play framework on both Macs and PC’s. The game will also be available on the Mac App Store, although its not clear if they’ve included multiplayer features in that version of the game. In addition to the new multiplayer support, Trine 2 features massively updated graphics, improvements to gameplay mechanics, new levels, a new story, and more. The game is expected to ship “sometime next month.” To see more, check out the official trailer below, or visit the official Trine 2 website. The original version is available now on the Mac App Store ($ 1.99, link). It would seem that the Mac App Store, a central -but not exclusive- online repository for Mac software, has renewed the interest amongst game developers for the Mac platform. Perhaps it is the hype, maybe it is due to Apple’s marketing, or the iCloud allure, or lower app prices, or the sheer size and convenience of an Apple-branded distribution channel. Nevertheless, evidently, more triple-As have become available on the Mac these days – good news for gaming aficionados. Firemint, the developer that previously ported its popular Flight Control onto the Mac, is bringing another smash iOS hit, Real Racing 2, to the Mac desktop. Available for $12.99 (non-U.S. users, follow this link), the 711MB download lets you enjoy high-definition racing powered by Firemint’s proprietary Mint3D engine. You can also use your iPhone or iPad as a steering wheel. Firemint highlighted noteworthy features, such as the 16-car grid, Quick Race and Career modes, and 15 racing tracks. It also has a decent selection of 30 officially licensed cars, including the 2010 Ford Shelby Mustang GT500, 2010 Nissan GT-R (R35), 2012 McLaren MP4-12C and more. In addition, Firemint recently updated the iPad version with native 1080p video output via AirPlay. It is discounted for a limited time from $10 to just 99 cents. More Mac gaming news is featured after the break. A new Sam & Max adventure from Telltale Games makes it's way to iOS. Pro adventure game developers Telltale Games have released the newest chapter of their popular Sam & Max games on iOS. These classically styled adventure games that follow the zany exploits of the sleuthing dog and rabbit duo are generally split up into shorter, episodic titles, and the same is true for this release. Sam & Max: Beyond Time and Space – Episode 1 ‘Ice Station Santa’ is the first of five episodes in this new adventure and in this episode, Sam and Max take on none other than the big jolly man himself. This game will include a core story mode as well as a “Whack da Ratz” mini-game and a soundboard where players can craft their own quotes using character voices from the game. Sam & Max: Beyond Space and Time: Episode 1 is currently available in the iOS app store for $6.99, and is a universal app that can be played on iPhone, iPod, or iPad. Last week Overhaul Games announced that Baldur's Gate: Enhanced Edition would be making its way to the iPad later this summer. Baldur's Gate: Enhanced Edition is a recently announced remake of the original 1998 game and Tales of the Sword Coast expansion pack. The original game was well received and sold over two million copies worldwide. 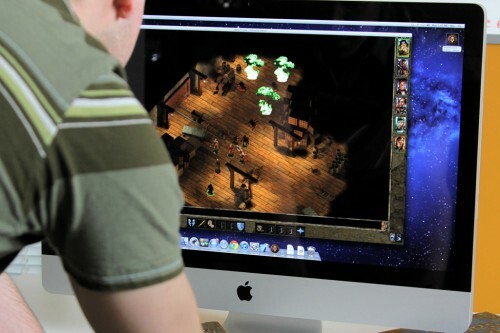 The company has now announced that the game will also be available for the Mac in summer 2012 in the Mac App Store. Baldur’s Gate: Enhanced Edition™ runs on an upgraded and improved version of the Infinity Engine. It includes the entire Baldur’s Gate adventure, the Tales of the Sword Coast expansion pack, and never before seen content including a new adventure and a new party member. The company reports that there will be a variety of Mac OS X specific features "including widescreen and iCloud support". Grand Theft Auto III for iOS and Android was introduced earlier this year for $2.99 with much fanfare. Today, we have more exciting news from game maker Rockstar, who has announced that Max Payne Mobile is launching for iOS on April 12th and Android April 26th. Max Payne Mobile is a mobile optimized version of the full Max Payne classic released in July of 2001, Rockstar announced on its blog today. The game will feature HD graphics (no word if it will be Retina optimized for iPad), connectivity to Rockstar’s Social Club, and fully customizable controls. There’s no word on pricing, but presumably it will be priced at $2.99 like Grand Theft Auto III. This is sure to be a popular game for those of us who remember playing it on our PC and PS2 almost a decade ago. Are you as excited as we are? We’ll let you know when it’s available in each respected store.